Thank you for selecting Game Turbo Booster. The technology that is incorporated into this product, combines the newest CPU techniques to provide your applications with the greatest application performance. 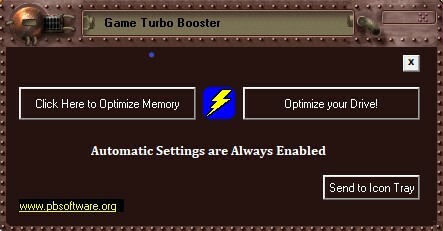 Game Turbo Booster optimizes your computer’s performance and makes your computer faster by the use of a matrix and by prioritizing the CPU's performance based on the matrix. Other running applications are also prioritized based on the matrix and given a priority. No matter how fast you’re CPU, Game Turbo Booster will make the application you are running much faster. you want to quit using Game Turbo Booster. This is the only way that you can disable Game Turbo Booster. This is a real time performance product made specifically to give your applications the best speed possible. This product will improve all applications that are being used by the user. Only $6.99 for limited time! BLOW OUT! We hope you enjoy the product as much as we do.